Put a pin in the calendar, invite some friends over, pull your fluoro spandex down out of the attic, fire up those black lights and let’s party! For those new to the Global Goa Party concept, this is a “virtual” party in which each DJ submits a 1.5hr mix containing music produced in a certain year, and those mixes are posted on the Ranch and streamed on DI.fm’s Goa-Psy channel at a pre-determined time. We’ll also have a live chat available during the party for those of you still able to operate a keyboard; last year’s chat was a blast! More info will be posted closer to the party date, so check back often. There’s also a Facebook event for those who are into that sort of thing. See ya on the trancefloor! !!! 🙂 lovin’ it already 🙂 !!! appreciate and love your efforts. “The cost of sanity in this society is a certain level of alienation.” -Terence McKenna, it is actually not Terence who said it but Albert Einstein. Hope you find this well as I don’t mean to be a critic but instead a well-wisher. Regards. Critique and well-wishing both taken graciously, my friend! 🙂 Can you point me to a reference for the original quote? I had heard it in one of McKenna’s talks (via podcast) but would not be surprised if he lifted it from Einstein. I did some digging and haven’t found the quote as originally attributed to Einstein, so would love to find the source. Regardless of who said it, I find the quote quite apt for today’s societal prejudice, but most definitely would like to give credit where credit is due. What an interesting year to mix from–still plenty of older style acid lines but also the emergency of the proggy sounds. Going to be a great party! 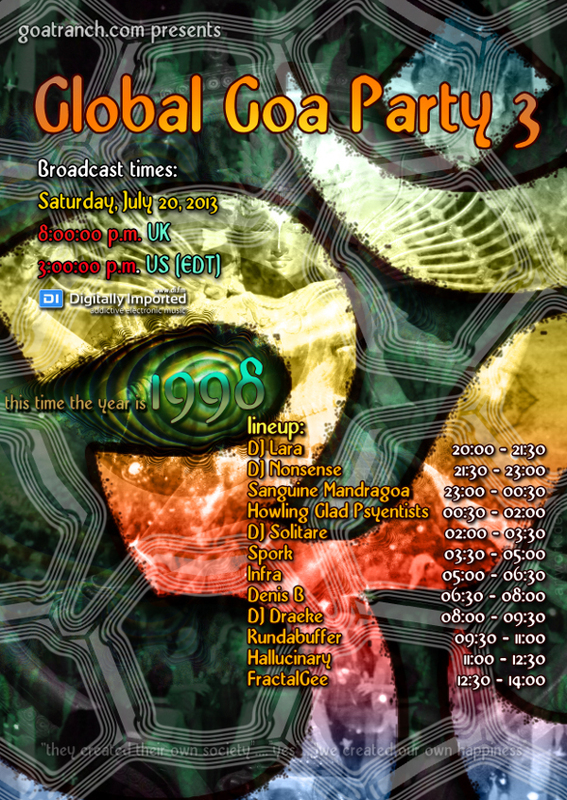 Any idea when the next Global Goa party will be, and what year it will be for? I missed GGP3, but was there for about 5 hours of GGP2. What a truly awesome concept! I love it. every mix I’ve heard so far, from all of the DJ’s is top notch. Thanks for the kind words! Right now the thinking is some time in the spring, perhaps around the equinox. The two years up for debate on this one are 1995 and 1997. Maybe it’s time for a new poll to see what people would like to see next? Thanks again, see ya at the next one!